A picture is worth a thousand words- especially when it's part of a stunning presentation. When you can keep eyes riveted to the screen, it's a lot easier to share information. 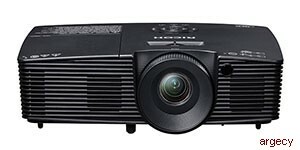 If someone asks how you do it, you can point to the low price and reliability of the portable RICOH PJ S2240 projectors. Reliable RICOH PJ S2240 projectors are built for worry-free operation. In standard mode, the lamp life is rated at 4,500 hours. In eco-mode, 6,000 hours. Stay on the bright side Bright is better, especially when you can't control a room's lighting. With ratings of up to 3,100 lumens (WXGA) and 3,000 lumens (XGA/SVGA), you can keep everyone engaged. * Lamps are consumable products and therefore are not covered by the projector's warranty. ** Native support for Frame Sequential 3D format. Other sources may require a converter that is not provided. 30" - 300"/39.37" - 393.7"